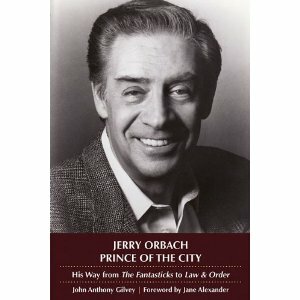 Jerry Orbach, Prince of the City: His Way from The Fantasticks to Law and Order by John Anthony Gilvey. Hal Leonard Corporation. Theater Shelf, a recurring feature, will review recently-released books, CDs and DVDs of interest to theater lovers. 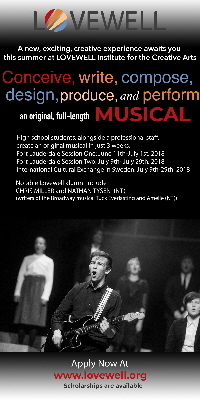 Some will be popular titles like a new Original Cast Recording, others will be works you’ll be intrigued by but didn’t even know about. Its a mouthful (or a page full) any way you cut it, but this book by John Anthony Gilvey covers so many areas of a lengthy career that you can forgive the lack of brevity. It is something of a shame that the text itself seems to compensate with an excess of concision, trimming many of the stories and sub-stories to their essence, when a few more details and illuminating side observations would have helped. The subject deserves deeper delving. While the title of this biography about actor Jerry Orbach is a mouthful, this book by John Anthony Gilvey covers so many areas of a lengthy career that you can forgive that lack of brevity. But it is a shame that the text itself is almost too concise, trimming many of Orbach’s stories when a few more details and illuminating side observations would have helped. The subject deserves deeper delving. Here is, after all, an actor who originated one of the most successful leading man roles in the history of Off-Broadway theater: the combination narrator/prime mover El Gallo in The Fantasticks in 1960. Imagine what would have happened had he signed a run-of-the-play contract. He was 25 years old when the play opened at the Sullivan Street Playhouse in Greenwich Village. He was eligible for Social Security when it closed. Orbach then had a Broadway career that covered a half century. He introduced three musical roles that have lived on long after his run in the original productions. 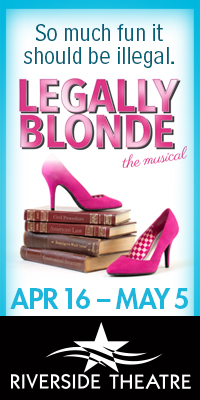 He was Chuck Baxter, the bachelor loaning out his apartment to his superiors at work in Promises, Promises; Billy Flynn, the sleazy lawyer in Chicago; and Julian Marsh, the manipulative producer in 42nd Street. He also originated the role of Paul, the emotionally crippled puppeteer, in Carnival. Orbach’s career paralleled the discovery by Broadway producers that there was money to be made out of re-visiting the hits of the past. He made the most of the developing field of revivals, starring in The Cradle Will Rock, Guys and Dolls, Carousel and Annie Get Your Gun. Along the way, he made repeated attempts to make a mark as a Hollywood star, scoring a number of apparent break-out roles in films although they never actually made his face a standard Hollywood commodity. Originating the voice of Lumière in Disney’s Beauty and the Beast was a heck of a finale to a movie career that included notable roles in films by Sidney Lumet (Prince of the City), Woody Allen (Crimes and Misdemeanors) and “the little film that could” – the 1987 box office smash Dirty Dancing. The success of that low-budget film threatened to limit his options by type casting him as the up-tight dad whose love of his children motivates a final resolution. Fans of theater, movies and television all mourned his death in 2004 when he succumbed to the prostate cancer he’d battled for 10 years without ever leaving the limelight. His accomplishment-filled life is detailed in this readable, but hardly exhaustive survey of his public career with occasional digressions into his private life. Gilvey covers his topic in just over 150 large print pages. While there’s hardly a deep analytical treatment of any of the aspects of Orbach’s life or career, it adds up to a breezy overview that leaves you feeling you knew the man he is writing about. Of course, many felt that they knew him long before the appearance of a biography. They had seen him in person. They had seen him on the big screen. And for so many years, they had seen him on the small one. In any medium, he was a performer whose basic persona came through no matter which character he happened to be playing. From the boastful lesson-giver “El Gallo” introducing the world to Try to Remember in The Fantasticks to his final scene as Law & Order’s Lennie Briscoe, it was always Jerry Orbach in view. But, unlike so many strong personalities whose identity seemed to overwhelm a role, Orbach always managed to merge his persona and that of the character into a convincing whole. Gilvey tells the story well, right up to the night the Orbachs attended Don Rickles’ opening at the Copacabana only to find that Gallo was there celebrating his birthday. They sent over a bottle of champagne to mark the occasion and then went home. Gallo and his party kept celebrating with an after-closing snack at a spot in Little Italy. Just as the sun was coming up, a trio of hit men burst in and opened fire, killing Gallo. It isn’t the kind of story you find in many show business biographies. It is a brief digression, however, from more traditional tales of a career spent in the public eye and of the family life of a man who comes across as a very nice person who didn’t have enemies – he only had friends and fans. This entry was posted in Book Reviews, Reviews and tagged Jerry Orbach. Bookmark the permalink.